in Beverly Hills, the historic Venice Canals, and a few assorted images from Los Angeles, California. 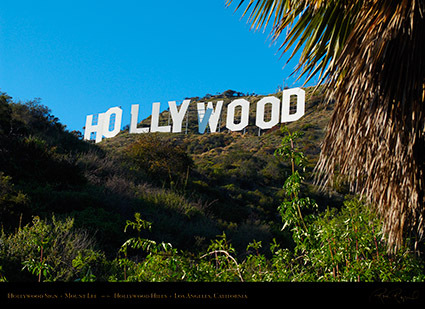 The Banner below leads to the Hollywood and Assorted LA Gallery where images can be purchased. 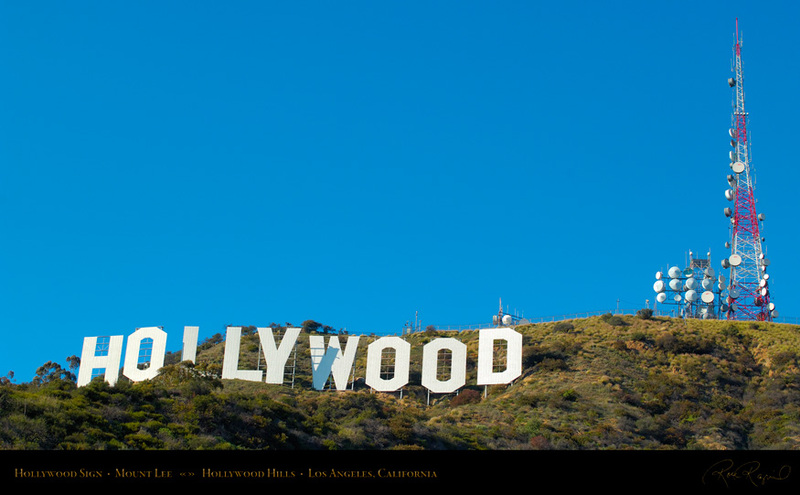 The Hollywood Sign, atop Mount Lee in the Hollywood Hills. More images further below. 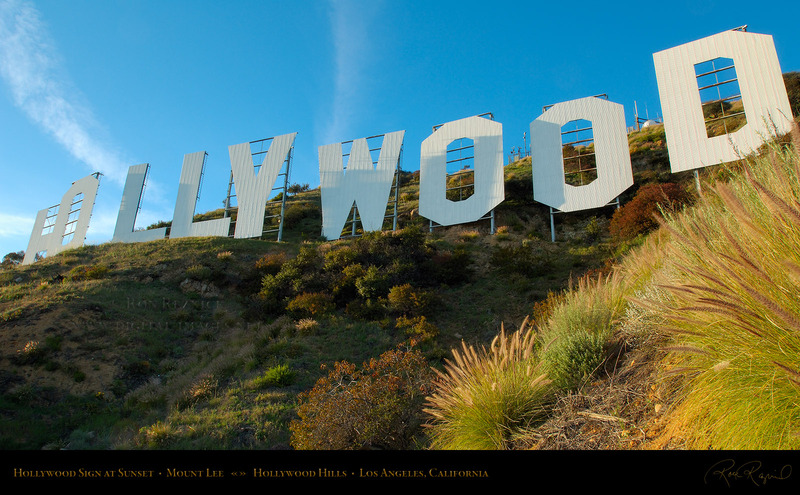 in the hills below Mount Lee, and originally said “Hollywoodland”, the name of the development. 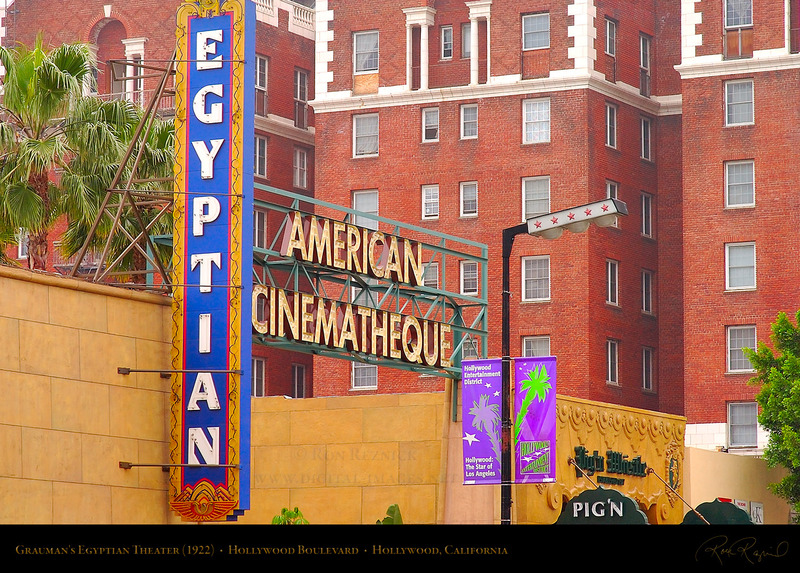 The Egyptian Theater was Sid Grauman’s first Hollywood theater and one of the first of the movie palaces in the US. 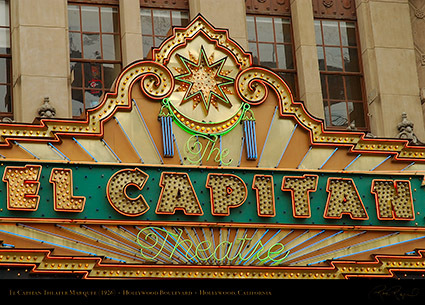 Grauman and Charles Toberman (the Father of Hollywood) later opened the El Capitan to display stage productions. Sid Grauman was the quintessential American showman, who first saw a motion picture when he was working as a paperboy during the Klondike Gold Rush in the late 1800s. He and his father made little in the gold rush, but were made wealthy when they opened theaters in Dawson City, Yukon. 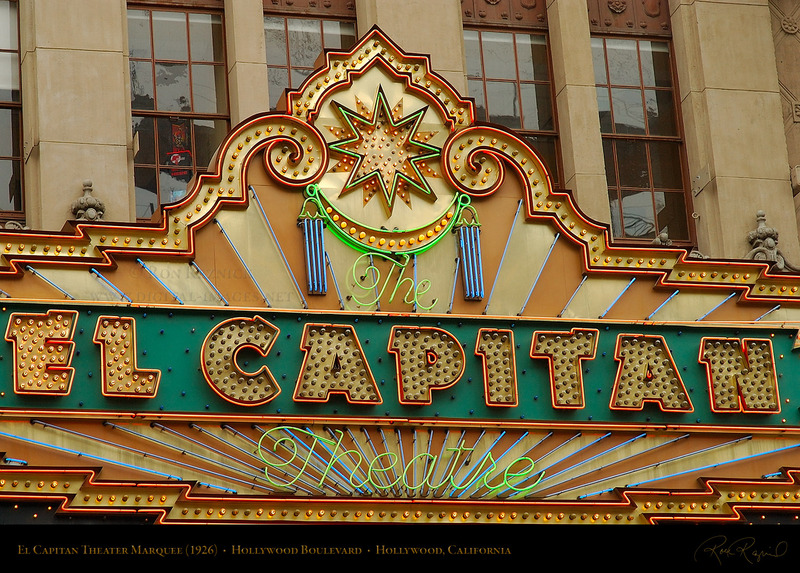 Later they moved to San Francisco, where their theaters were destroyed during the 1906 Earthquake, but they opened tent theaters immediately after with a projector saved from the ruins and were instrumental in boosting the morale of the citizens. They later decided to move their theaters to Los Angeles, and in 1918 Grauman opened the first American Movie Palace, the Million Dollar Theater in downtown LA across from the Bradbury Building. 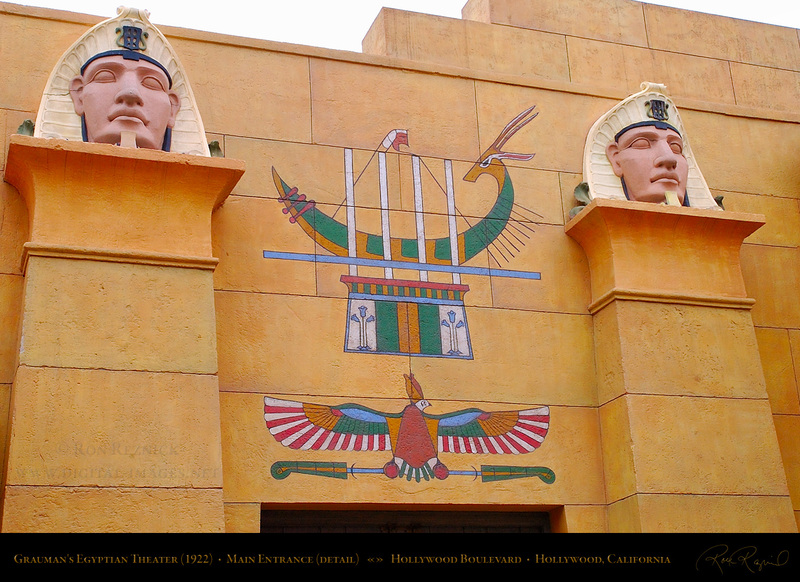 He then began work on the Egyptian Theater, which opened in 1922 at a cost of $800,000 (an enormous sum at the time). The Egyptian was the venue for the first Hollywood Premiere: “Robin Hood”, with Douglas Fairbanks and Wallace Beery, one of the most expensive films of the 1920s (budgeted at $1 million). 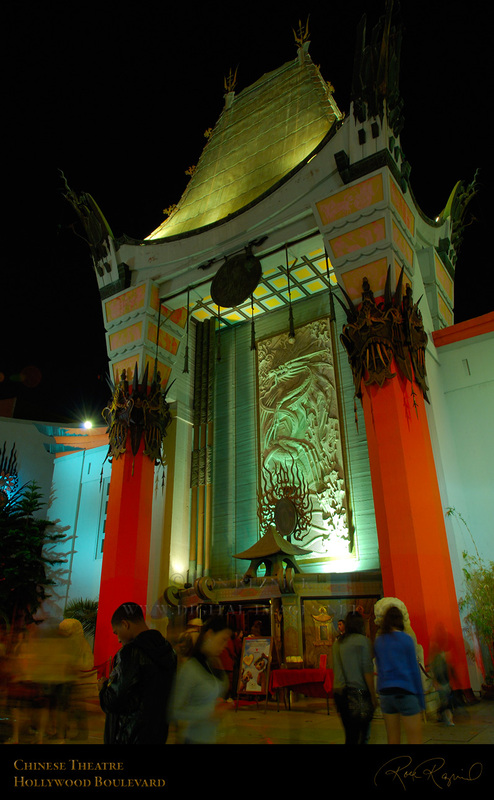 The film and the theater opened together, and in 1922 the film showed in no other Los Angeles theater. 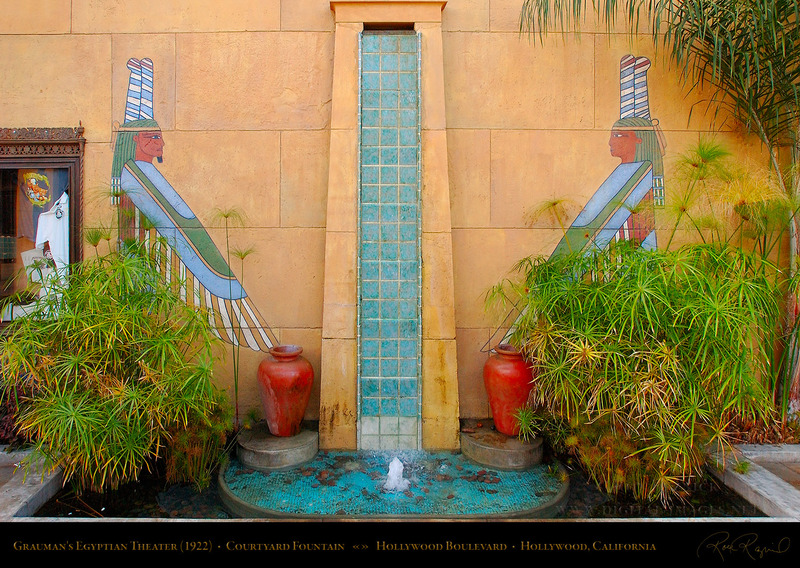 of Tutankhamun, which Carter finally found two weeks after the theater opened in October 1922.
so they were used in the roof pans. 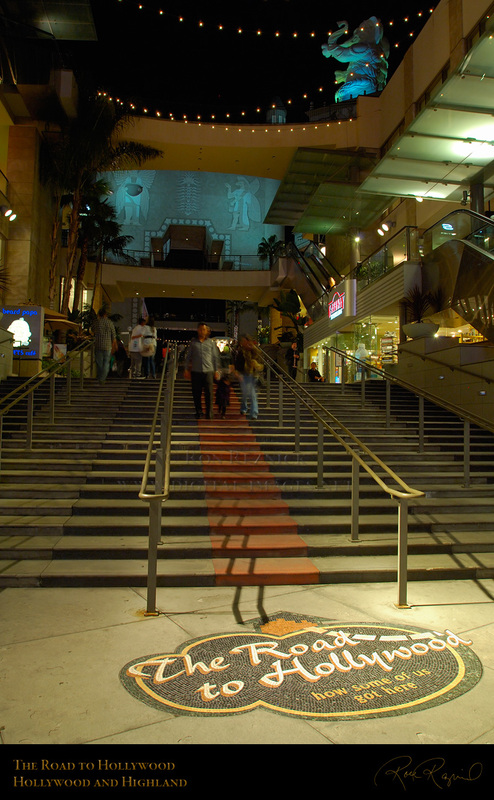 The courtyard was used for the red carpet ceremonies. 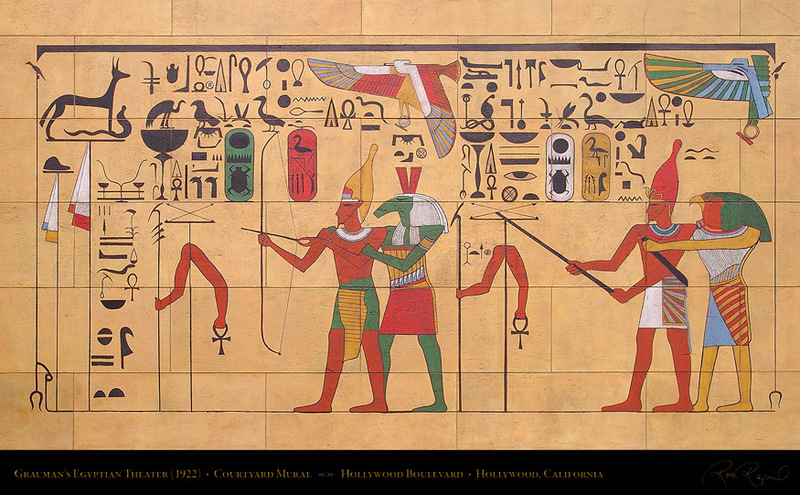 The exterior and interior walls featured Egyptian paintings and hieroglyphs. This restored mural is in the courtyard. that seats 616 and the smaller 77-seat Spielberg screening theater. 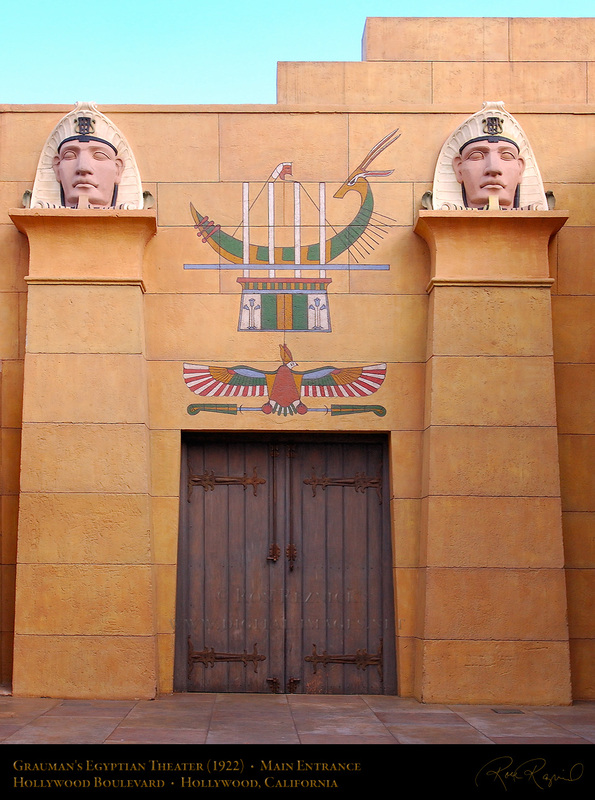 Detail of the paintings over the Egyptian Theater entrance and the heads atop the flanking pilasters. 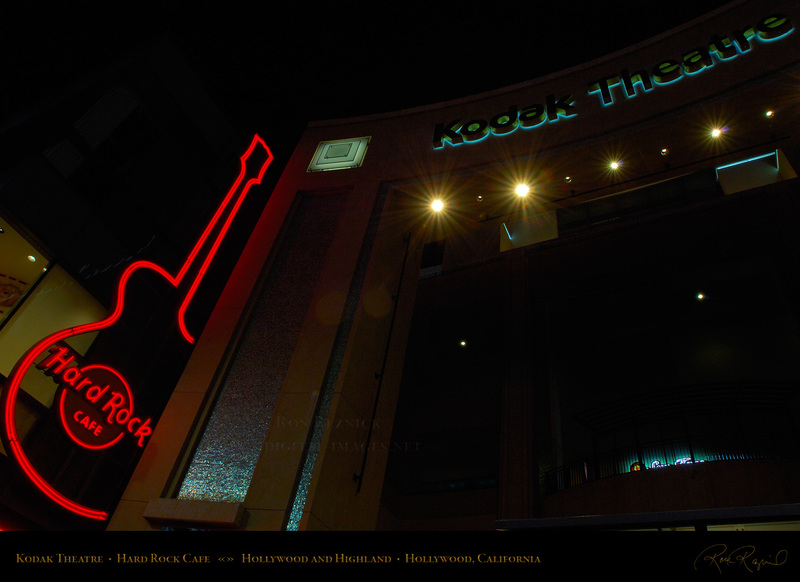 was a monumental $2 million, and the theater required 18 months to build. 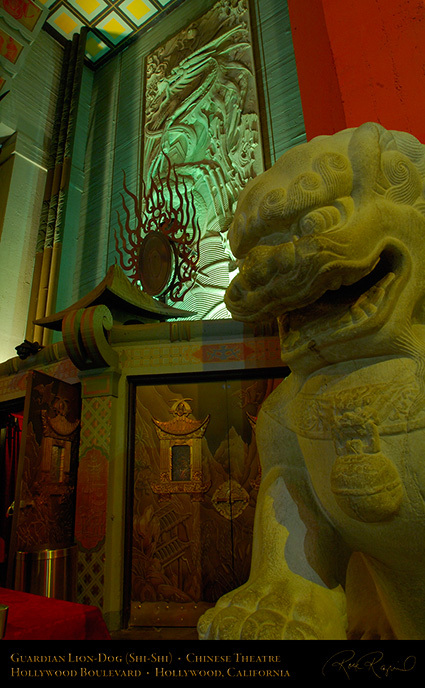 were imported from China along with artifacts used in the theater’s decor. and opened in May 1927 with the premiere of Cecil B. DeMille’s “The King of Kings”. Hollywood Movie Palaces, and it was declared a Cultural Landmark in 1968.
and frame the dragon panel and temple bell at Grauman’s Chinese Theater. to add their prints, although the cement was nearly dry so these were faint. the first of 200 celebrities to grace this most celebrated slab of concrete. 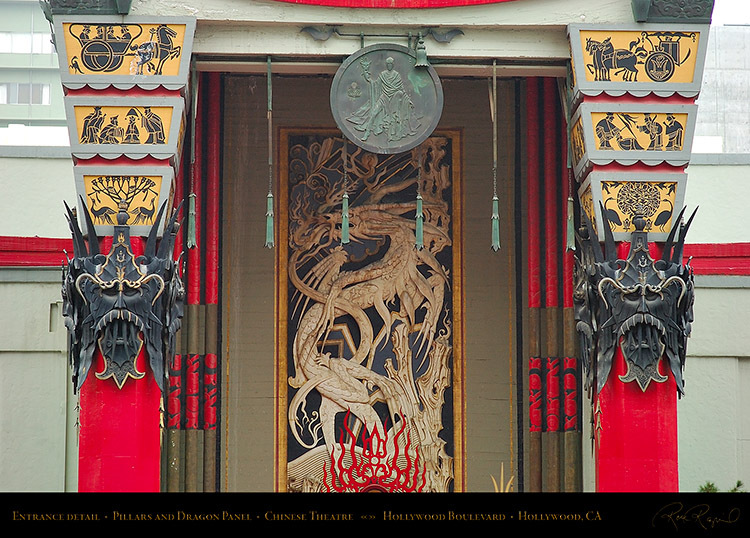 Jean Klossner performed all footprint ceremonies from 1927 through 1957.
wrought iron pillar masks and the dragon panel over the Chinese Theater entrance. complete their preservation projects in the lobby of this beautifully preserved historic theater. 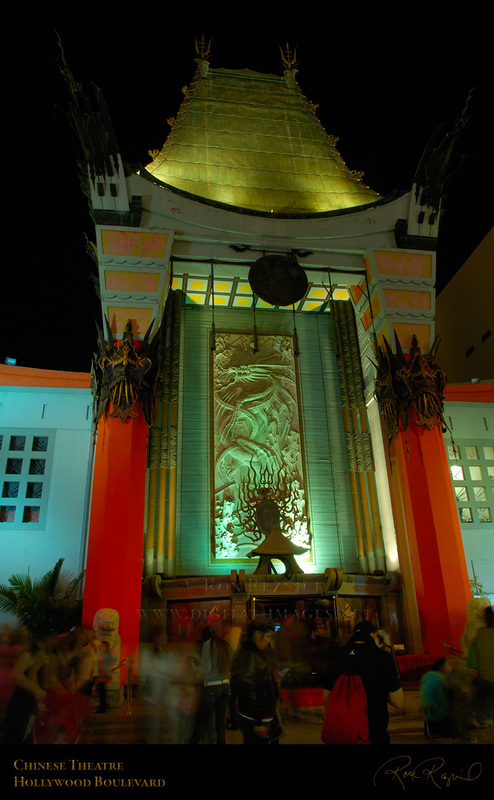 with the gala world premiere of the updated 1939 classic film “The Wizard of OZ - 3D”. 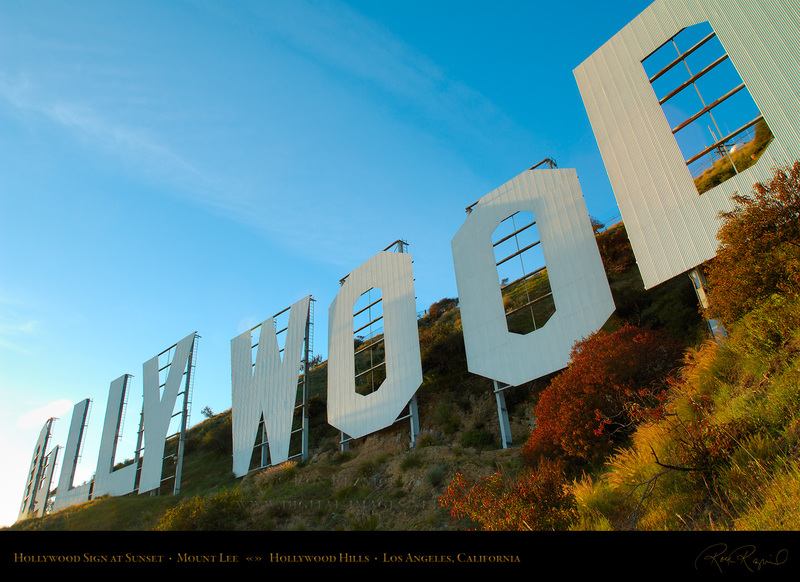 which hosts the Academy Awards) and the Grand Ballroom as well as other facilities. of the Silent Era. The complex is part of the community effort to revitalize Hollywood Blvd. 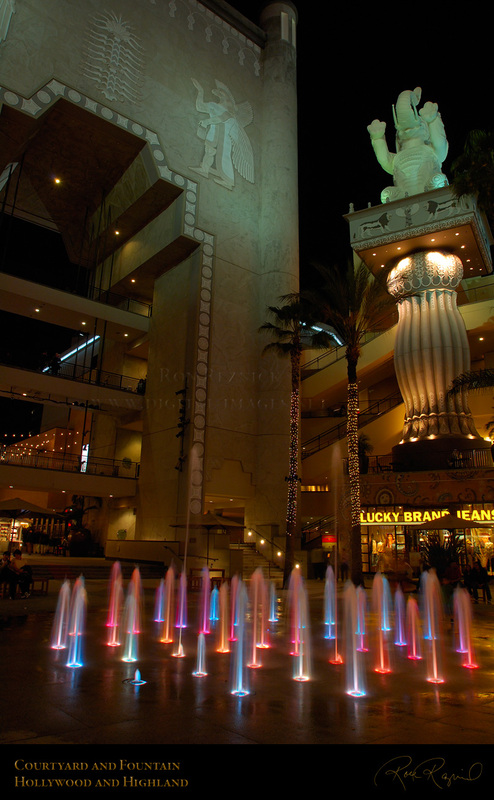 The central courtyard features a Babylonian theme and a fountain lit by a cyclic rainbow of lights. 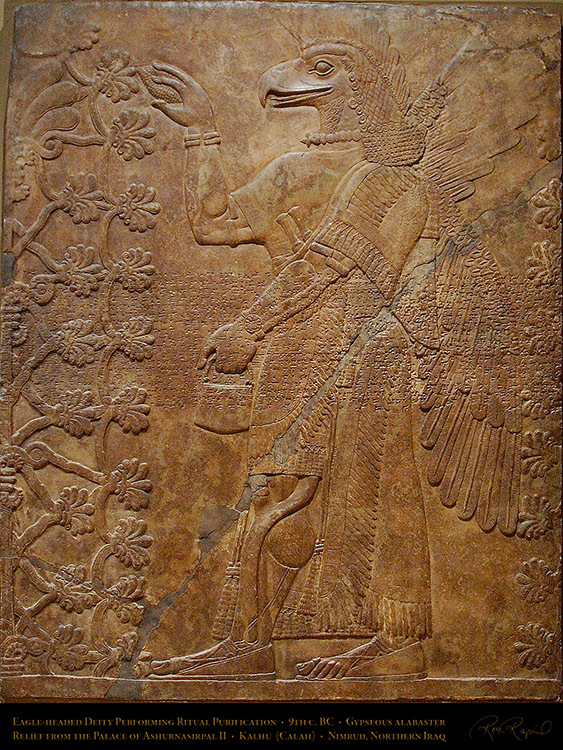 a bearded, winged Assyrian divinity holding a bowl (spanned by viewing bridges not in the set). An overhead view of the Babylonian courtyard at Hollywood and Highland from a viewing bridge in the arch. show in 2012 and it was truly spectacular, but less than 25% of the theater seats were occupied. 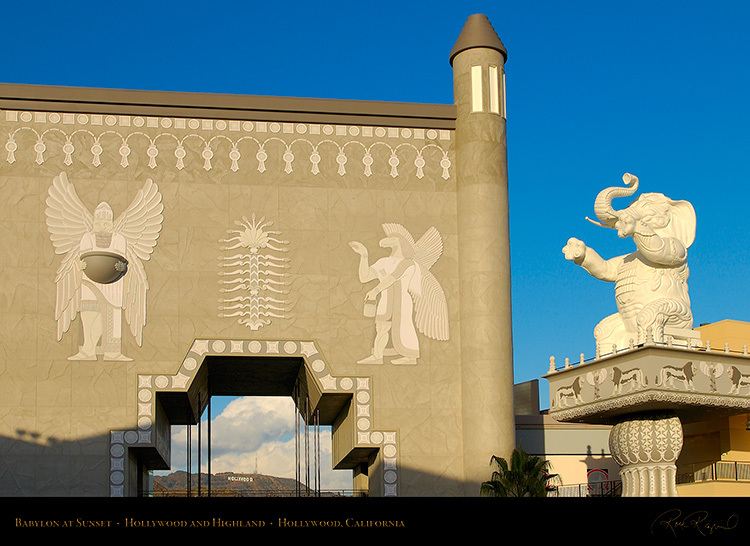 The Babylonian Arch and the two elephants on their pedestals at Hollywood and Highland Center. 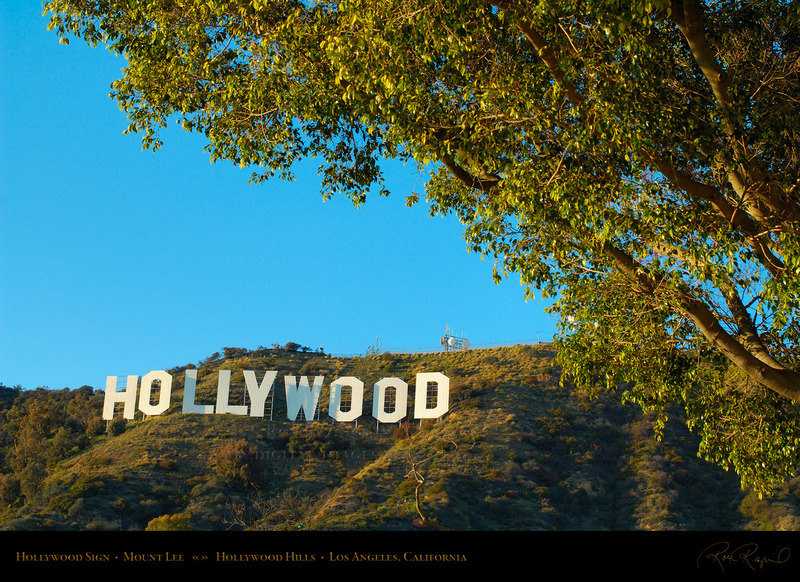 The Babylonian Arch frames a view of the Hollywood Sign in the distance on Mount Lee. 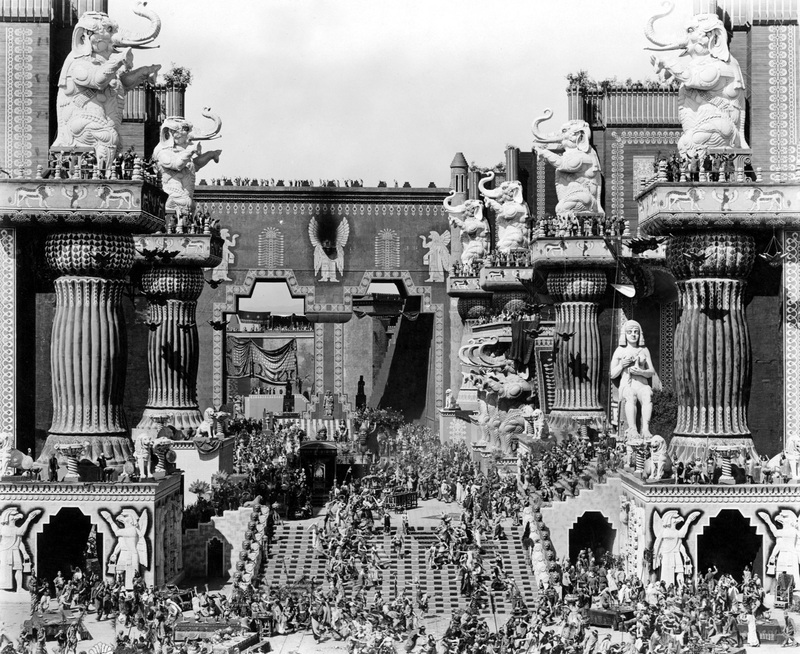 D.W. Griffith, Thomas Ince and Mack Sennett) was put up for sale, and soon ceased its operations entirely. Griffith could not afford to tear down the original life-size set, and it stood for 4 years until the Fire Dept. film so that Princess Attarea in the Babylon segment could flutter her eyelashes and brush her cheeks. 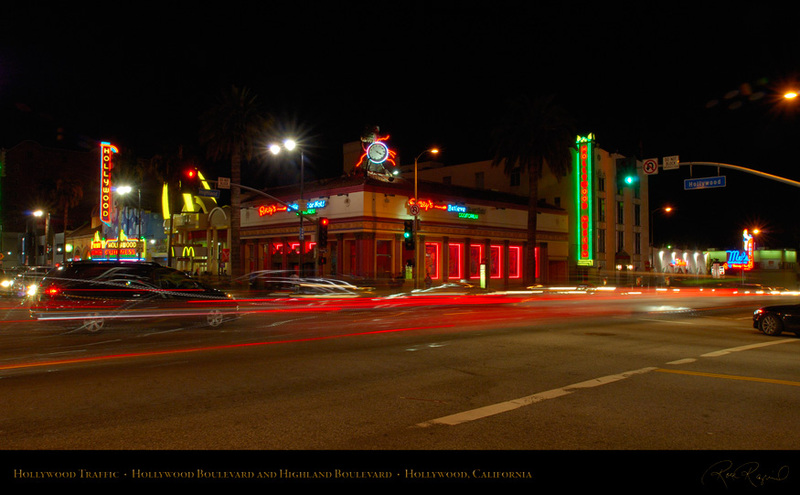 intersection of Sunset Blvd., Hollywood Blvd. 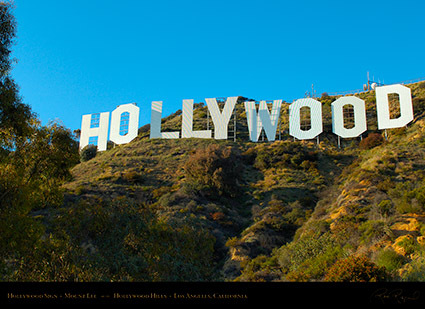 and Virgil Ave. at Griffith’s Reliance-Majestic Studios. 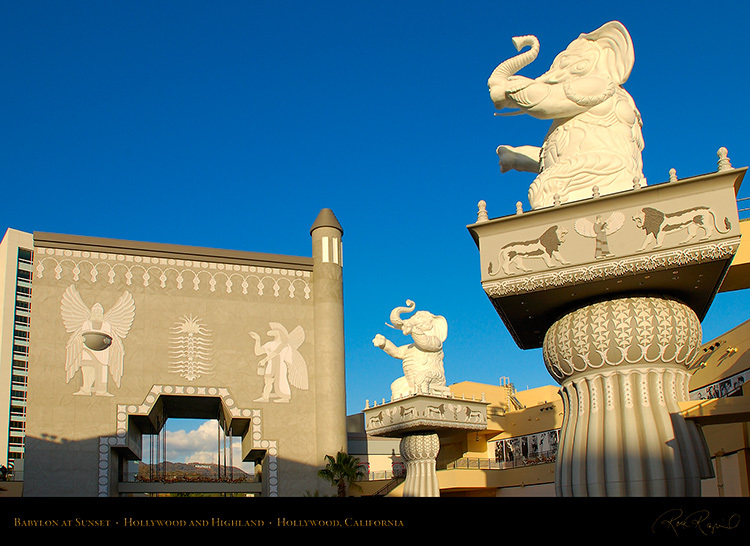 The two free-standing elephant statues next to the Babylonian arch at Hollywood and Highland Center. 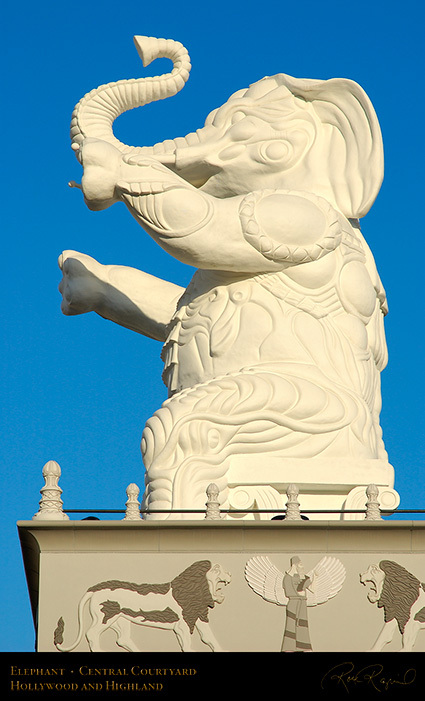 his researchers could not find any reference other than an obscure comment about elephants on the walls. 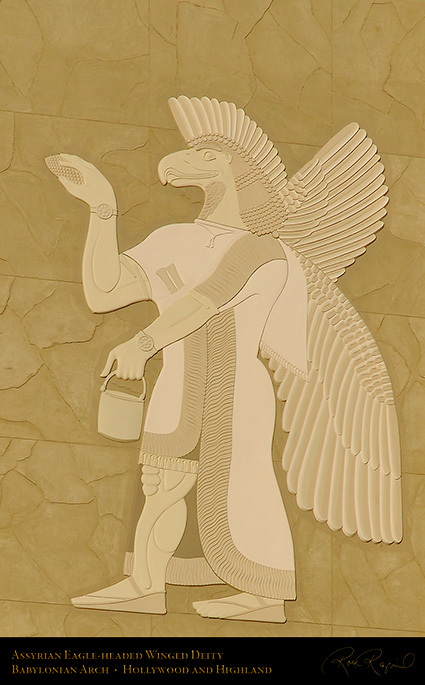 The Eagle-headed Deity on the Babylonian arch in the courtyard of Hollywood and Highland Center. depending on the source, and is shown with a water vessel and a fir cone or spathe (palm bract). the archaeological reference for the relief on the Hollywood and Highland arch. 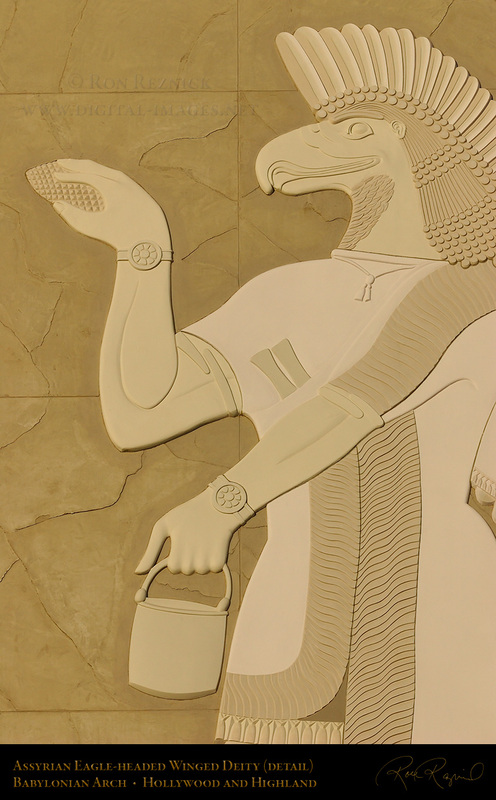 of Ashur, national god of Assyria and namesake of Ashurnasirpal. 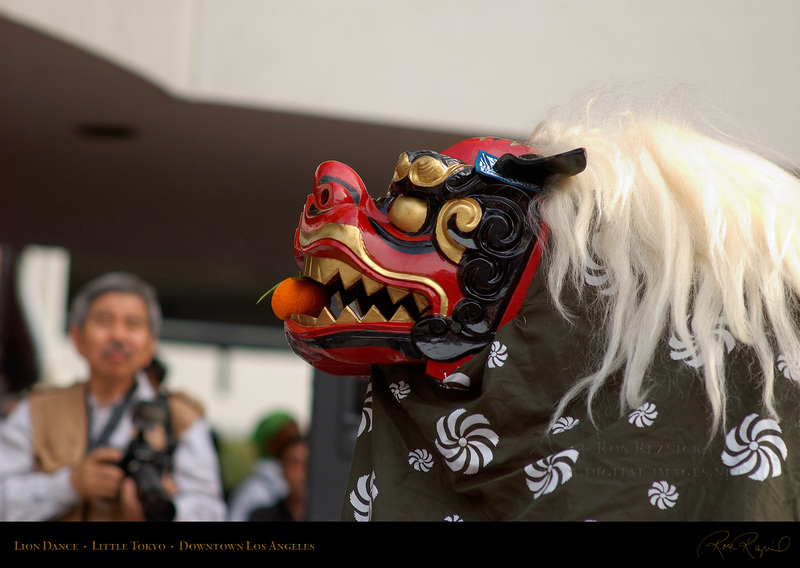 More images are on the LACMA Asian and Middle Eastern Art page. A 2 second exposure of the traffic at Hollywood and Highland at night. 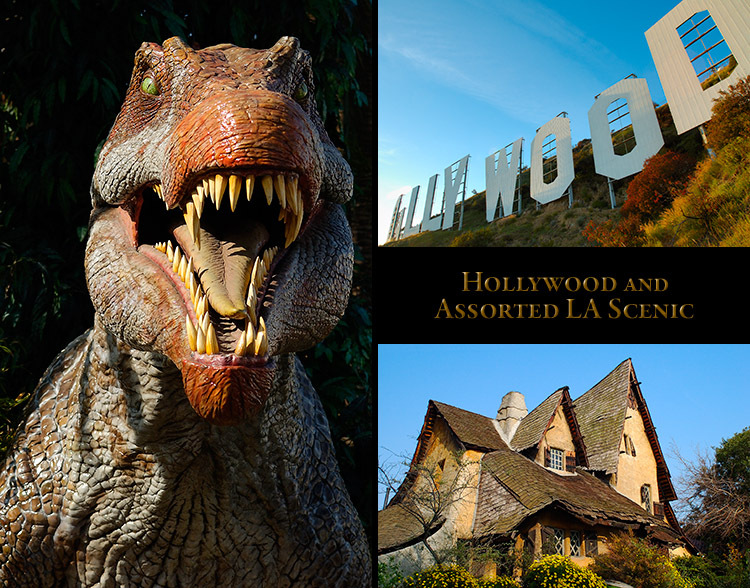 Hollywood Guiness Book of World Records and Ripley’s Believe it or Not Museums. 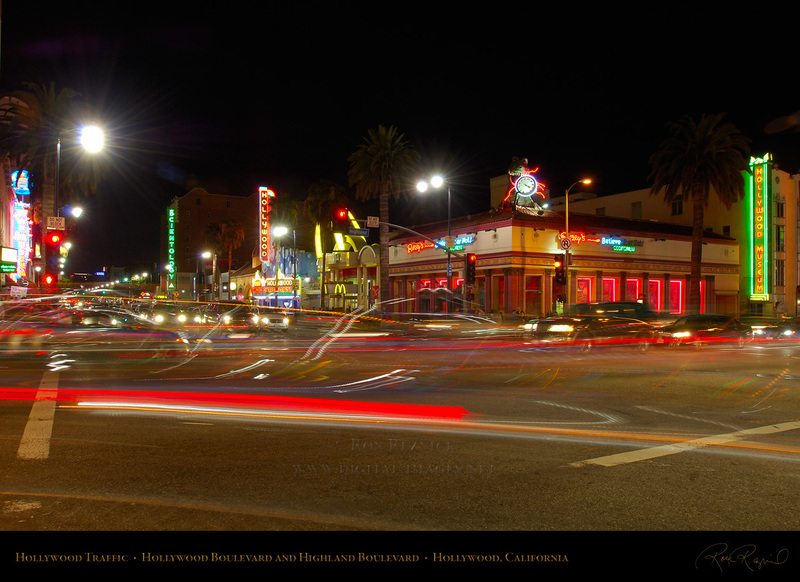 Another 2 second exposure of the traffic passing Hollywood and Highland at night. 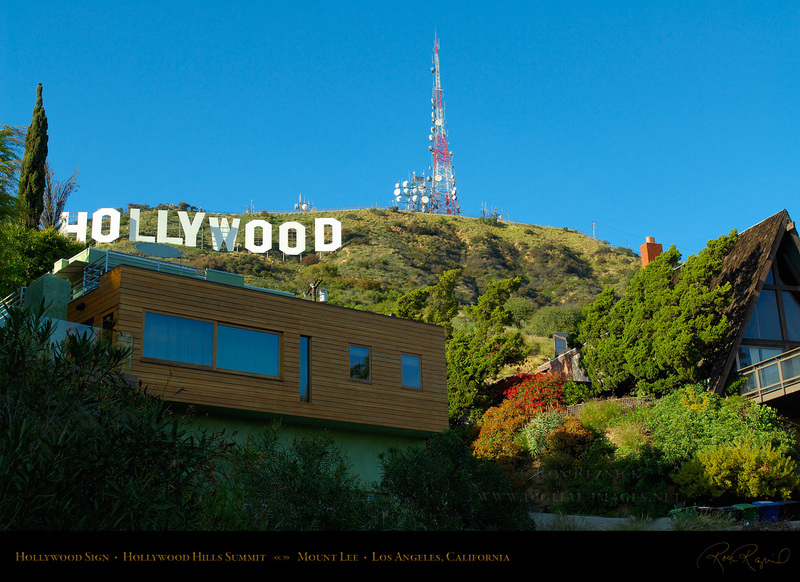 The Hollywood Sign below the crest of Mount Lee rises above the homes at the top of the Hollywood Hills. The left image was taken at mid-afternoon on Halloween day, and the right was taken at sunset in February. 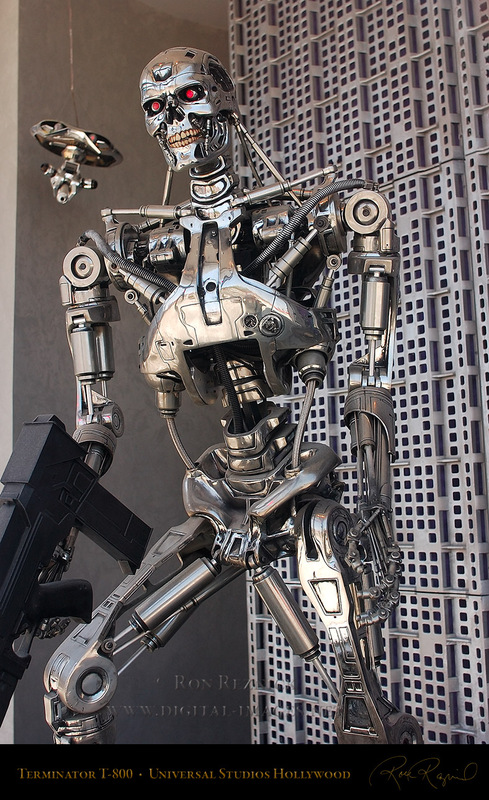 hire a team to develop technologies of filming, transmitting and receiving television, going live in 1931.
broadcast studio and filming facilities, and at the time the world’s highest elevation transmission tower. 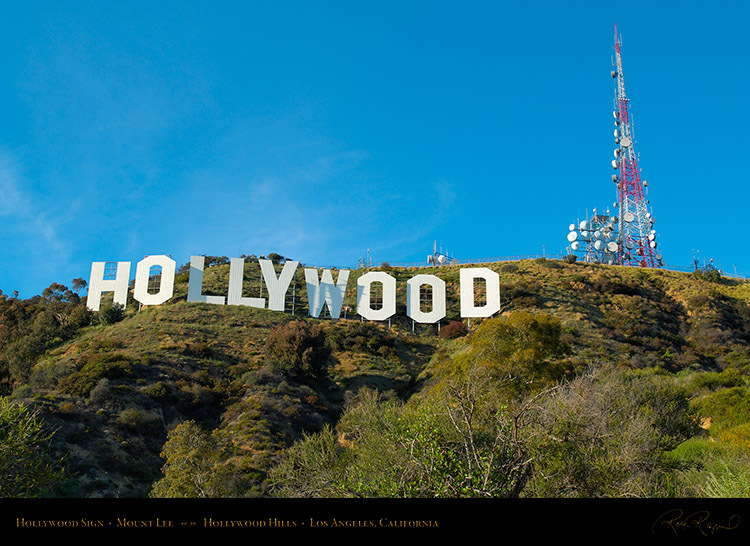 broadcast tower and the site atop Mount Lee are now operated by the City of Los Angeles. 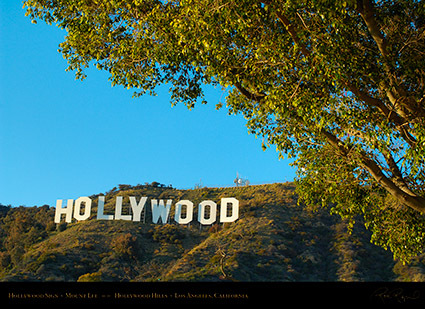 The Hollywood Sign at sunset from the steep hillside directly below the sign. 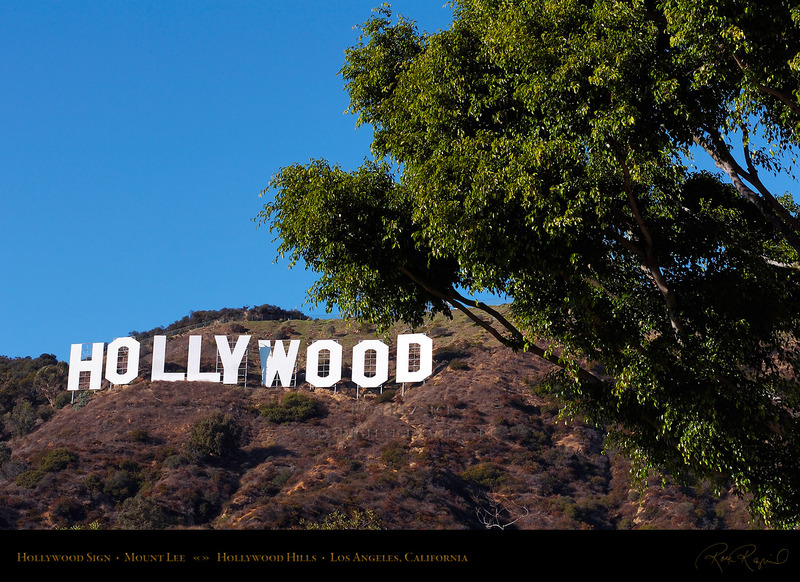 The Hollywood sign decayed over the years, and by the 1970s it was in pathetic condition. Hollywood Revitalization that led to restoration of historic theaters and the Roosevelt Hotel. The Universal Studios Globe at the end of Universal Citywalk near the entrance to the Studio Tours. 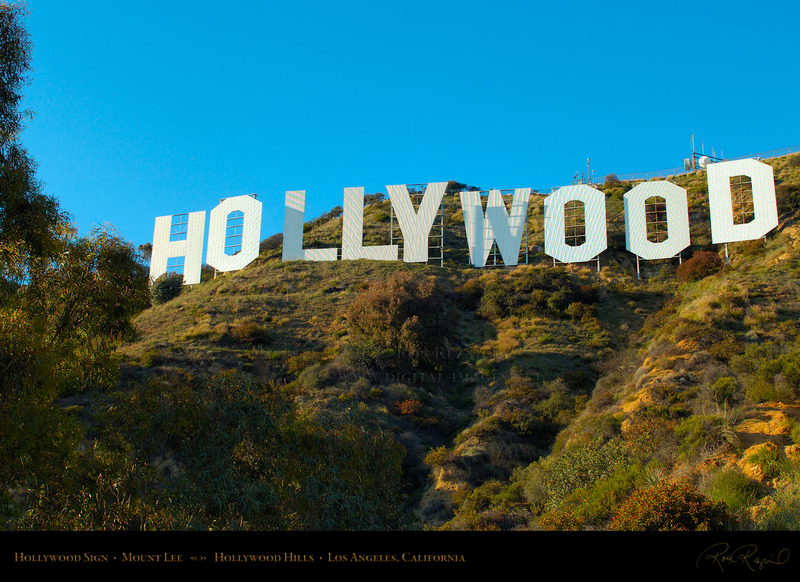 in New York to produce, distribute and exhibit motion pictures and avoid paying Edison for his processes. 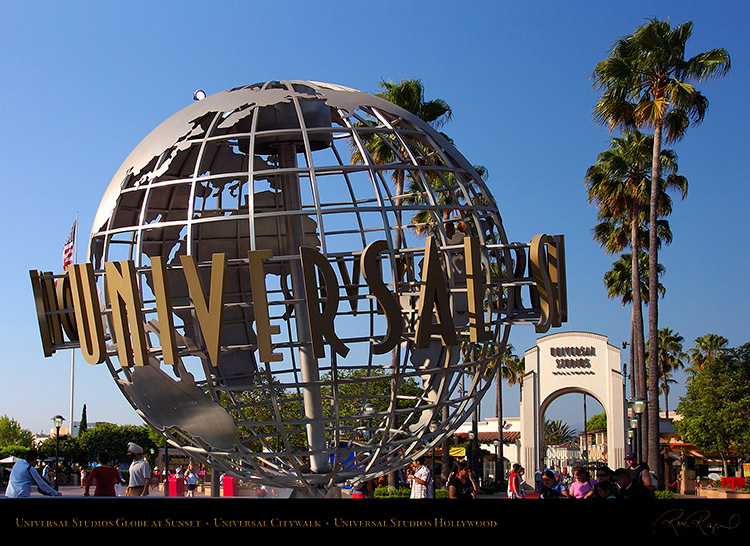 to tourists, and the Universal Studios Tours have been a major Hollywood attraction ever since. company called in the loan. 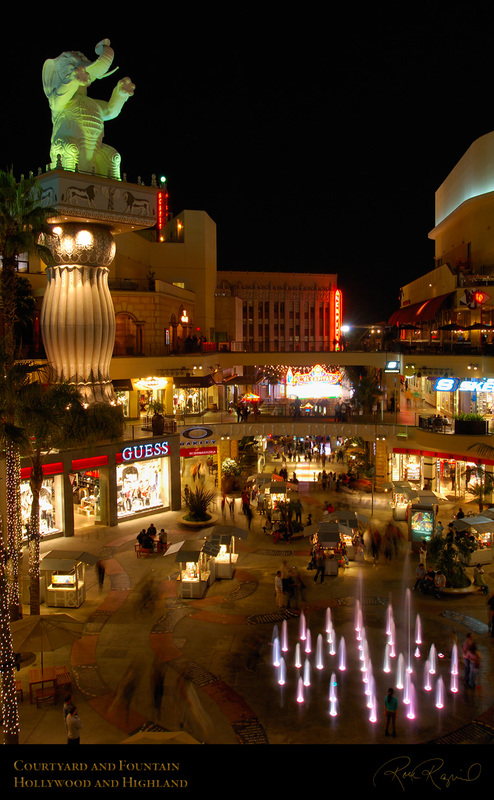 Unable to pay, the Laemmle’s lost the controlling interest in the studio. from radio. 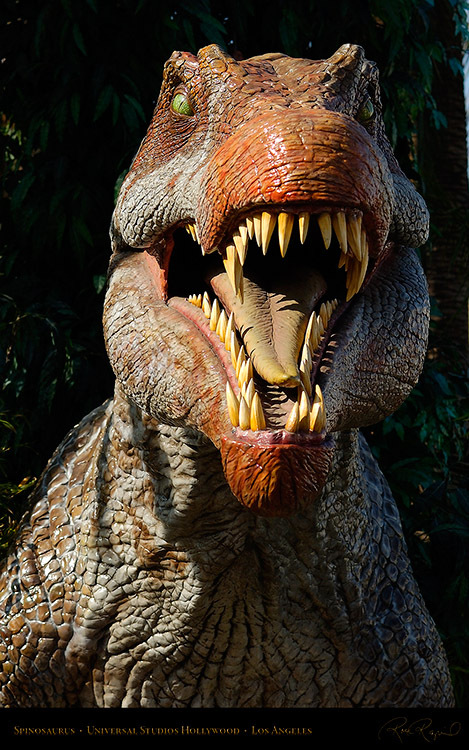 The studio was taken over by a series of conglomerates over the years, ending with Comcast. 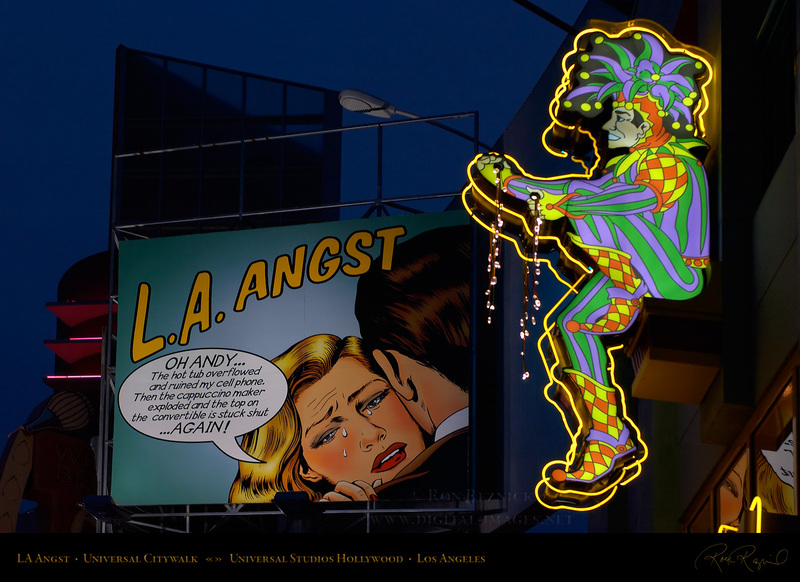 LA Angst is a billboard in Citywalk, the entertainment and retail district at Universal Studios. 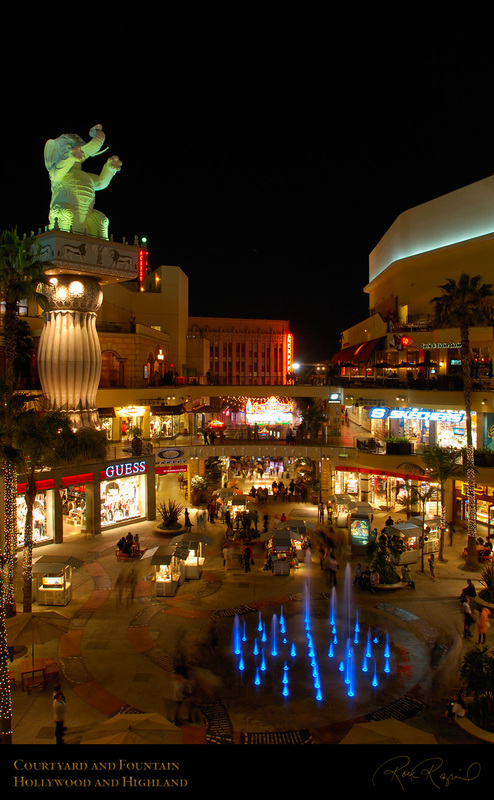 3 blocks, Citywalk has over 30 restaurants, a 19-screen theater, 7 nightclubs, and more than 30 stores. The Spinosaurus at the Jurassic Park attraction in the Universal Studios Theme Park. 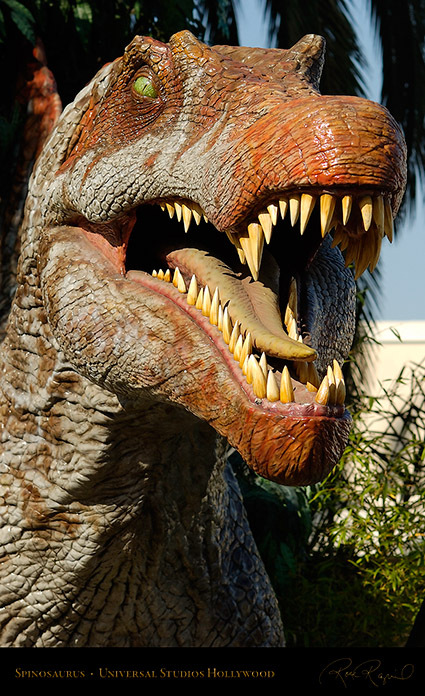 skull of this bipedal dinosaur was long and narrow, and it preyed on fish more than animals. 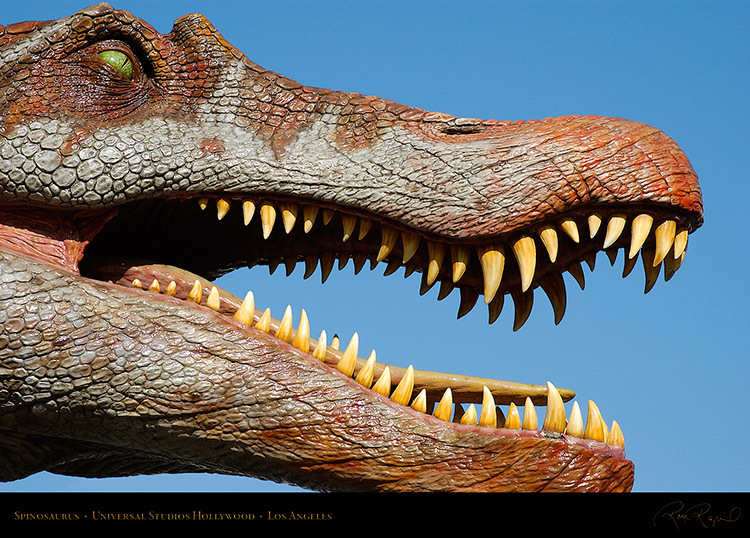 The Spinosaurus at Universal Studios Jurassic Park attraction, posing for a close portrait. right back towards the Spinosaurus, which fought, killed and ate the Tyrannosaurus for dessert. 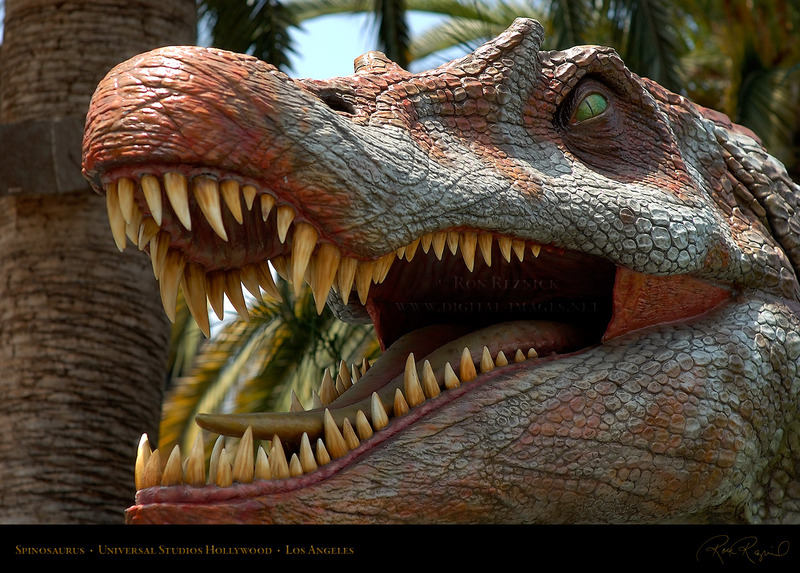 The gaping jaws of the Universal Studios Spinosaurus threatening to eat the photographer. 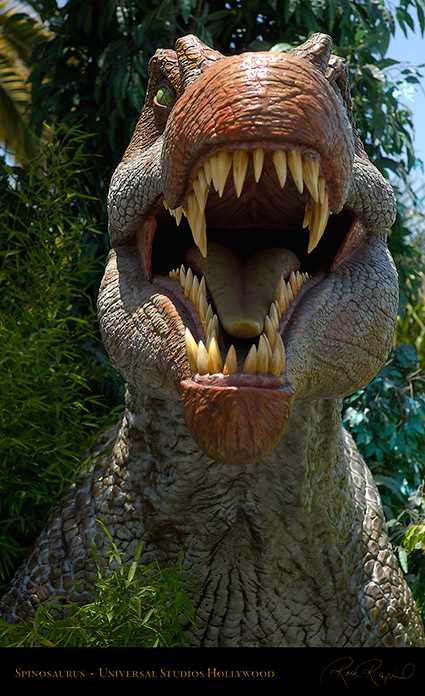 The linked image is a 1000 x 1600 pixel M-sized version of the available VLG master image. 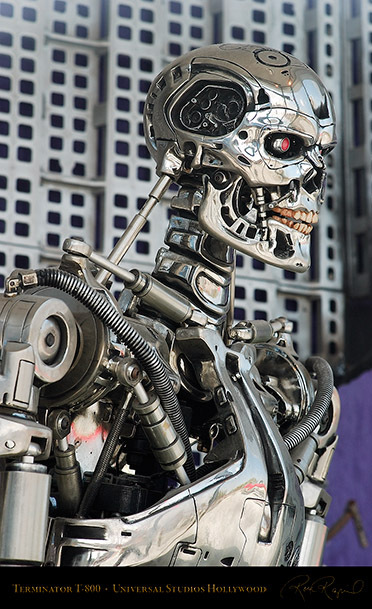 film in the franchise has been in limbo for many years, but is now scheduled for release in 2015. The full-size Terminator T-800 prop at Universal Studios Hollywood. A 1000 x 1600 image of the Terminator T-800 at Universal Studios Hollywood. 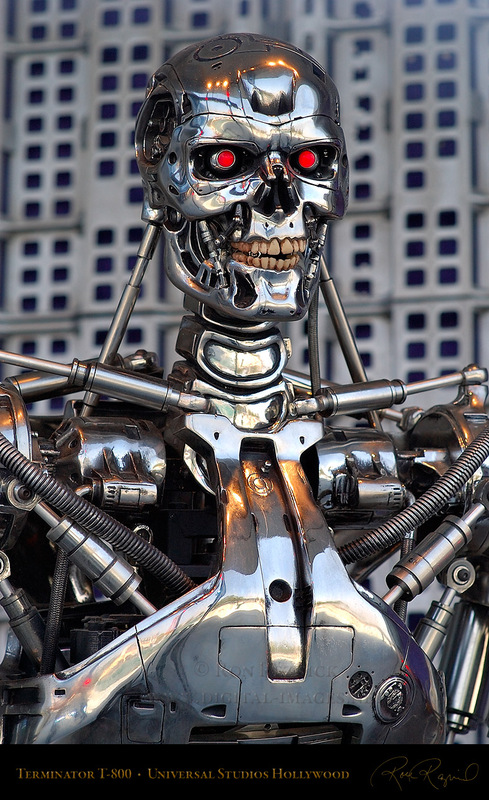 The T-800 was played by Arnold Schwarzenegger before his role as California’s Governor. Close portraits of the Cyberdyne Terminator T-800 showing detail of the cybertronic endoskeleton. 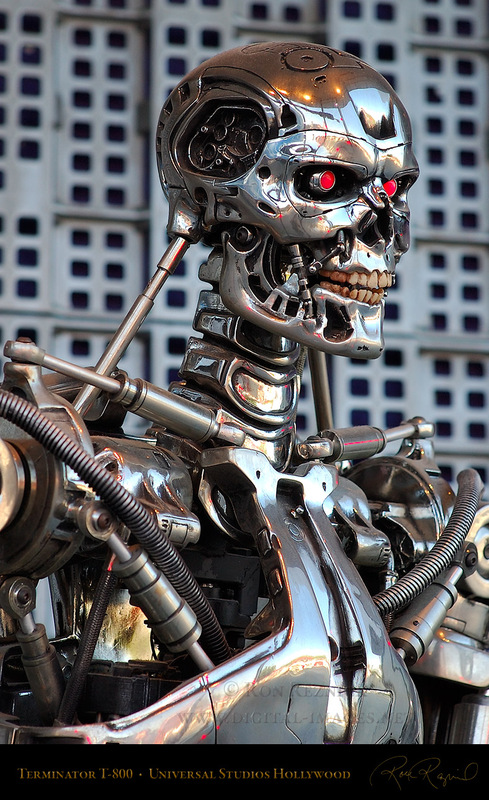 The android as played by Arnold Schwarzenegger had a living tissue sheath over the endoskeleton. forming and leading the human Resistance against Skynet in the future. 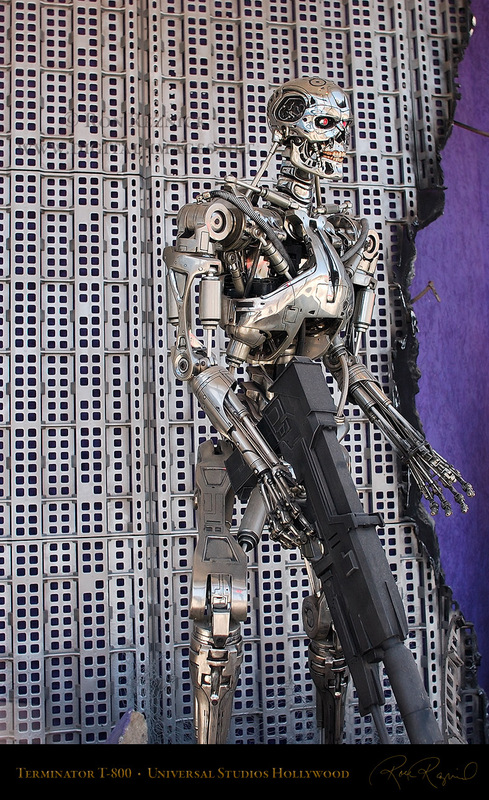 A 1000 x 1600 portrait of the smiling T-800 Terminator at Universal Studios. The Terminator franchise was one of the most successful for Universal Studios. 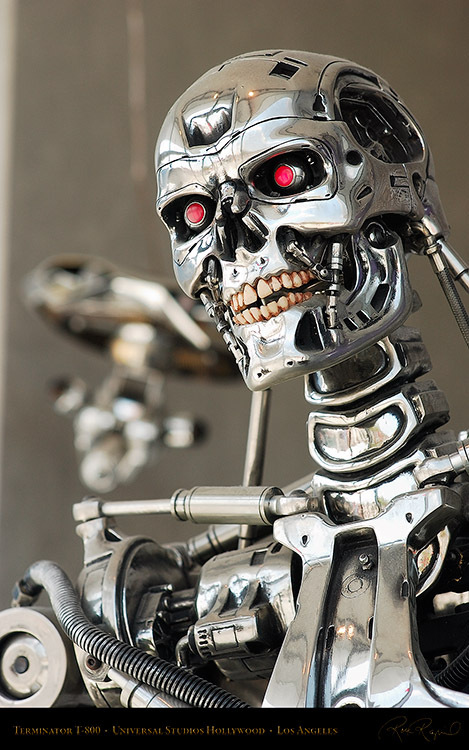 $925 million, and a new film (Terminator: Genesis) is slated for release in 2015.
surrounded by an intentionally overgrown English-style garden and a moat-like pond. warped unpainted picket fence add charm to this Storybook house. 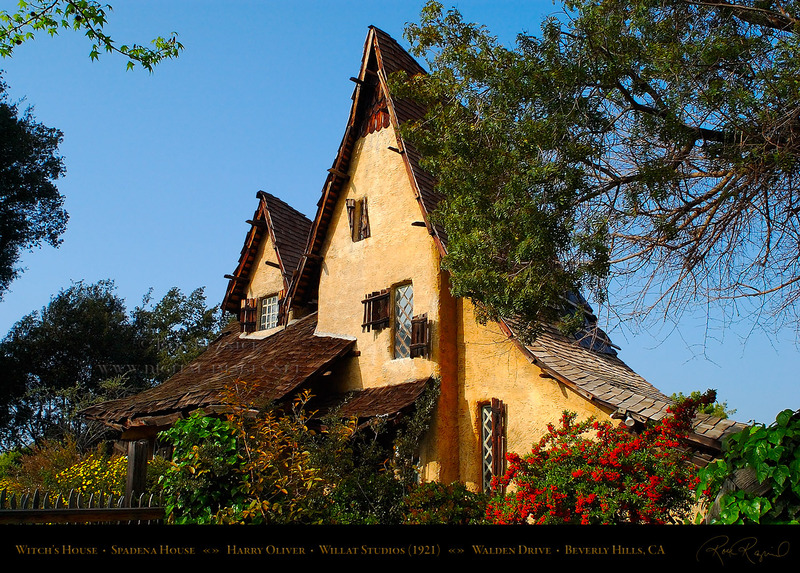 A 1000 x 1600 image of the Witch’s House (Spadena House) in Beverly Hills. 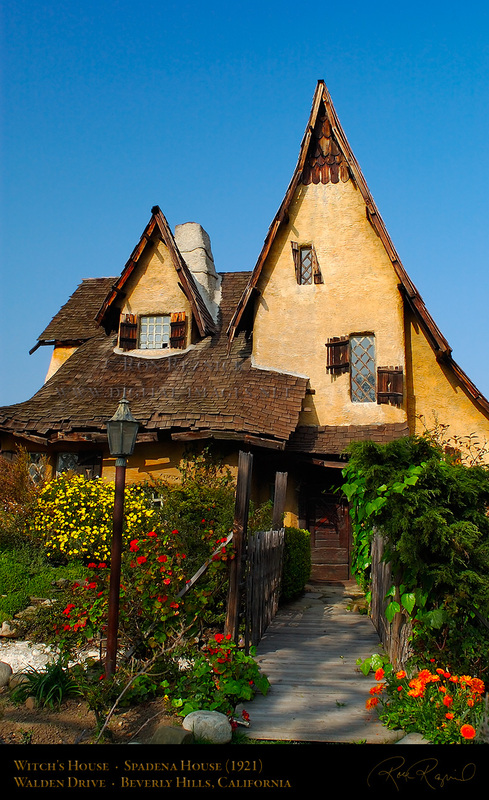 all of the prospective purchasers planned to raze the property and build a mansion. 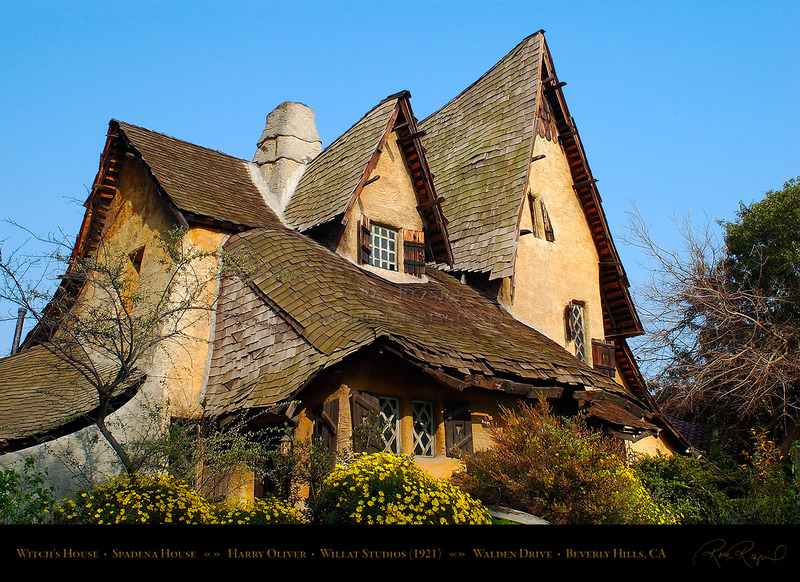 Nelson Coates to restore the house, adding Gaudi-esque elements to the interior. The Witch’s House (Spadena House) on Walden Drive and Carmelita Avenue in Beverly Hills. 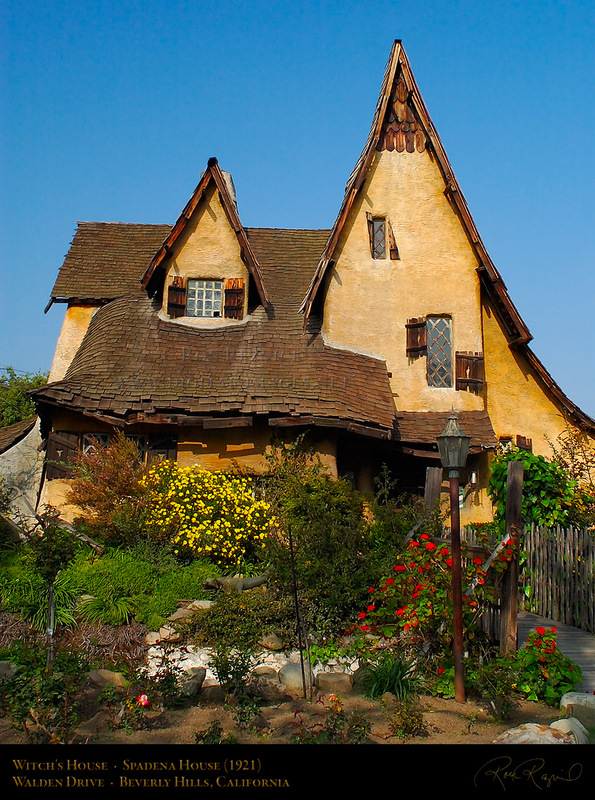 name Spadina got changed to “Spadena” in the name of the house (from owner Michael Libow). In the 1960s, my uncle lived in my grandfather’s old house at the other end of Carmelita and I often walked by this house. 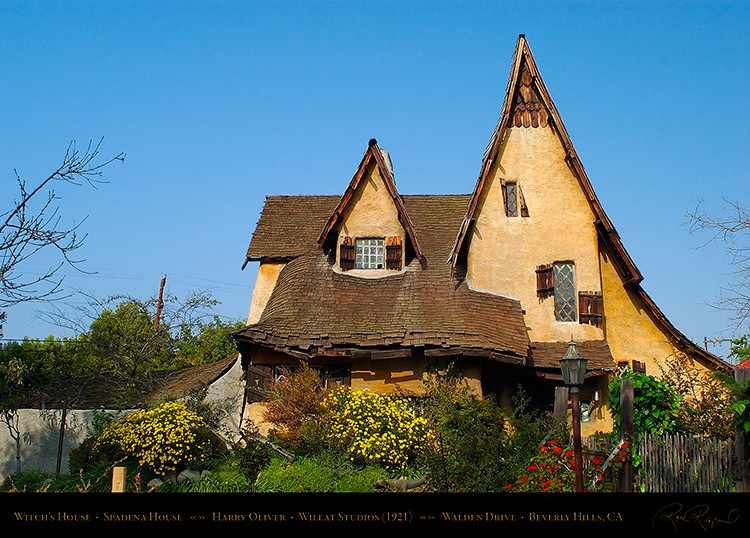 Ms. Green, who owned the Witch’s House at the time, used to really get into the character of her Storybook house and dress as a witch on Halloween. We thought she really was a witch. out of the floors. The bathrooms are fabulously tiled and they all have tree-like elements in the designs. 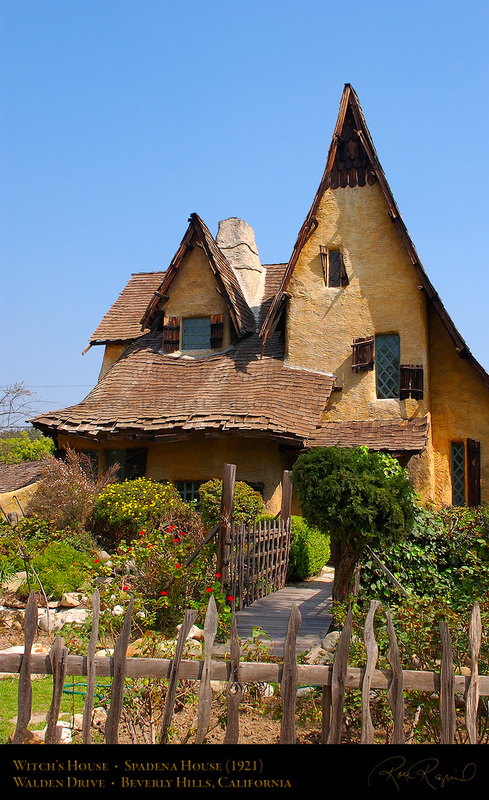 in Los Angeles, which is visited every Halloween night by up to 3500 children in a four hour period. 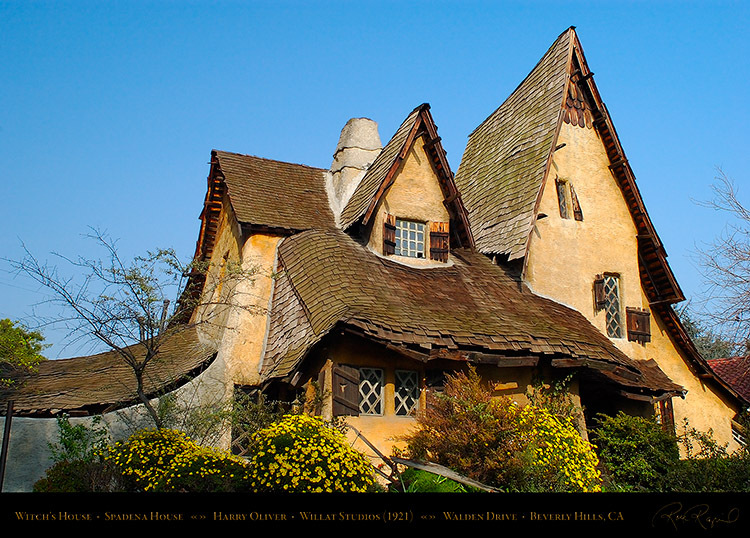 house both the exterior and the interior were constructed in Antoni Gaudi’s Art Nouveau style. the architect Tom Oswalt), which later was used in several films and television shows. 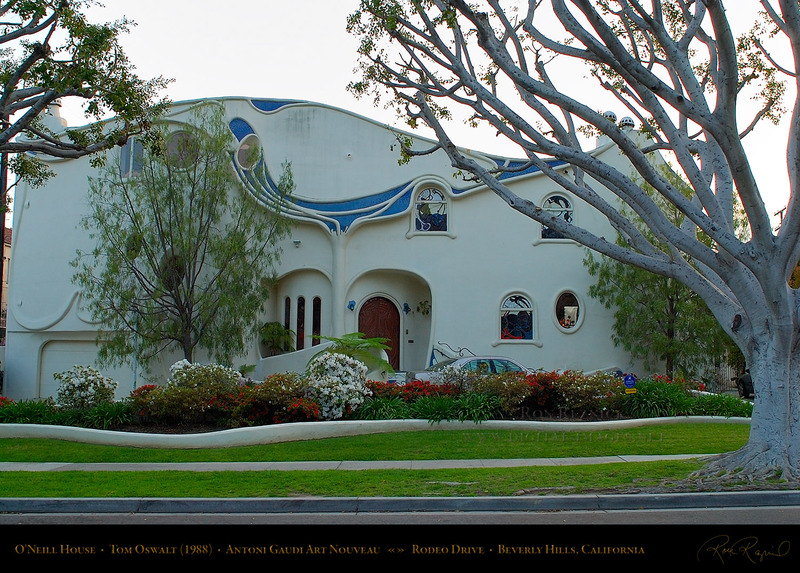 The surrealistic facade of the Art Nouveau O’Neill House at 507 N. Rodeo Drive in Beverly Hills. The house is located next to Beverly Hills Presbyterian Church a block north of Santa Monica Blvd. 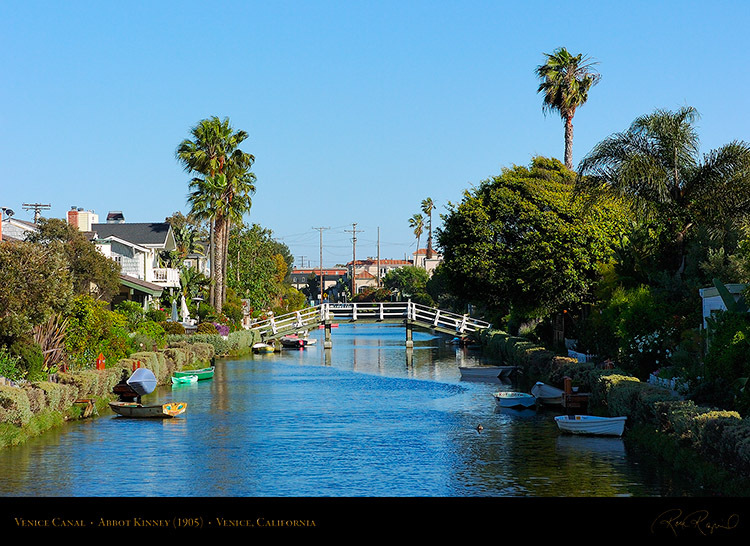 One of the historic canals of Venice California, founded by tobacco millionaire Abbot Kinney in 1905.
with newly renovated homes and many larger modern houses now lining the fully restored canals. The picturesque Venice Canals are three blocks inland from famous Venice Beach. 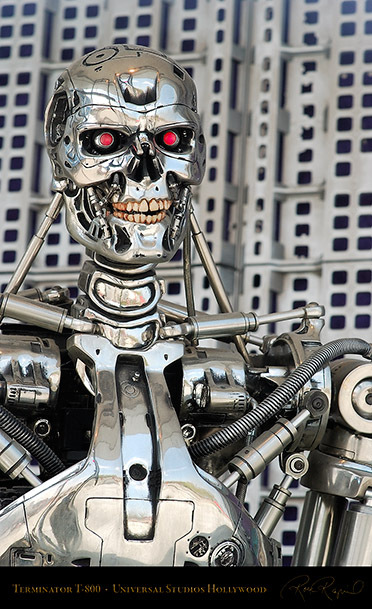 streets: Coral Canal is Main St., Grand Canal is Grand Ave., Altair Canal is Altair St., etc. 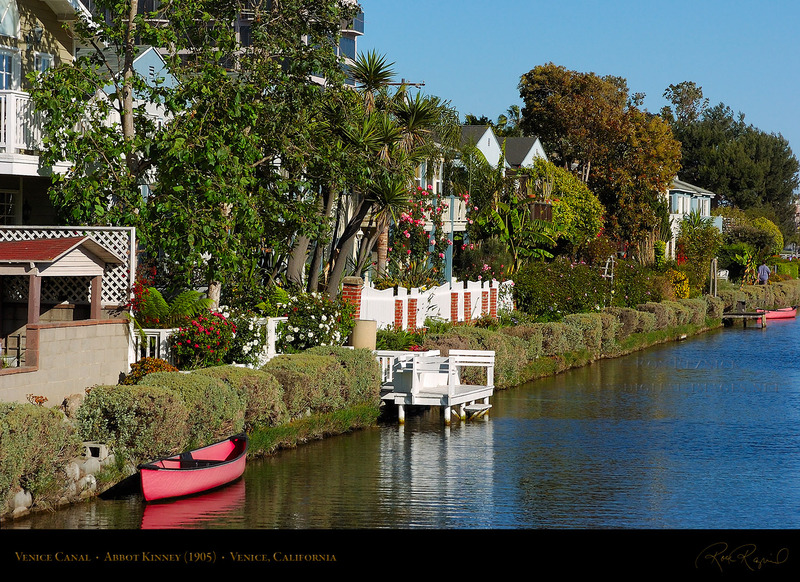 A quaint area of the Venice Canals with renovated cottages that contrast with the larger modern homes. 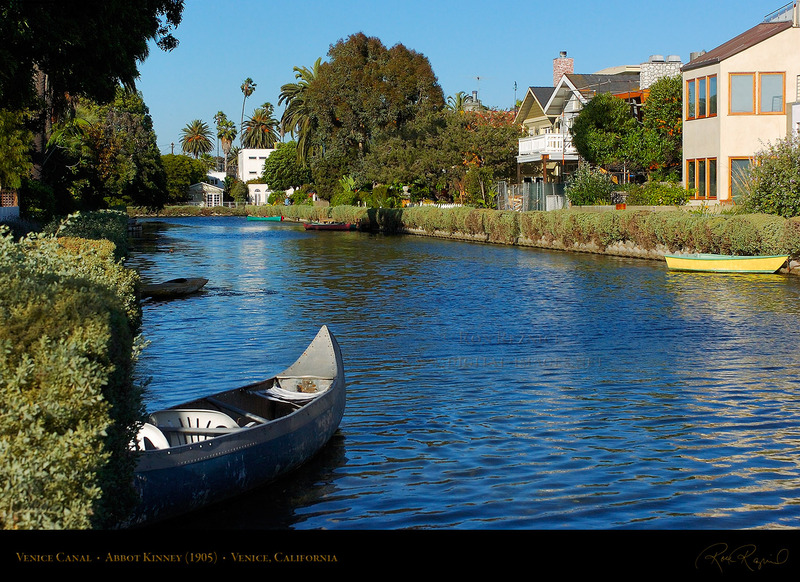 Kinney’s canals were filled in to become new roads, and Venice became a part of the City of Los Angeles. 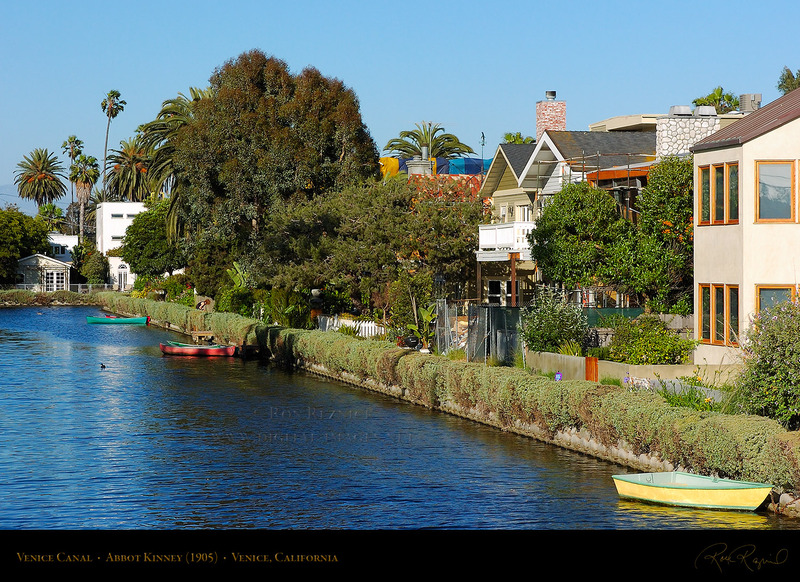 seventy years of deterioration before the Venice canals were transformed into the quaint site seen today. 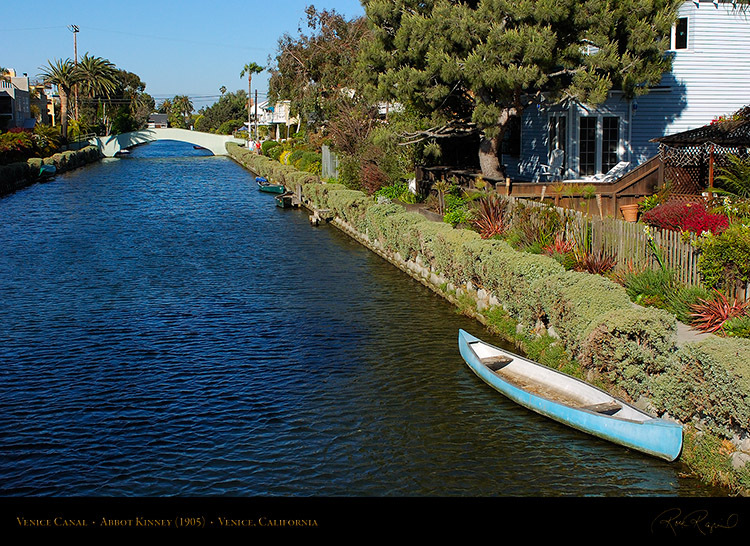 A group of canoes and rowboats lead the eye to a bridge over one of the Venice Canals. 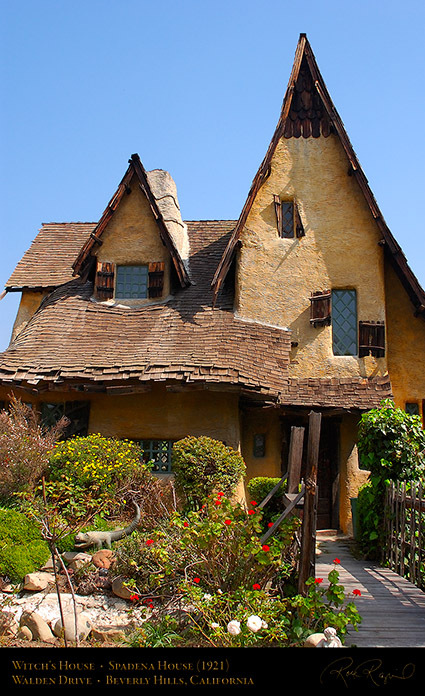 In the 1960s, the Beatniks adopted Venice as the perfect place to live their Bohemian lifestyle. later become hit lyrics when he and Ray Manzarek formed The Doors on Venice Beach in 1965. The Beatniks were later replaced by Hippie flower children in 1967 during the Summer of Love. at the end of the canal. The 500-1000 square foot original cottages were built in the early 1900s. Canoes, kayaks, paddle-boats and rowboats are used by area residents to navigate the canals. 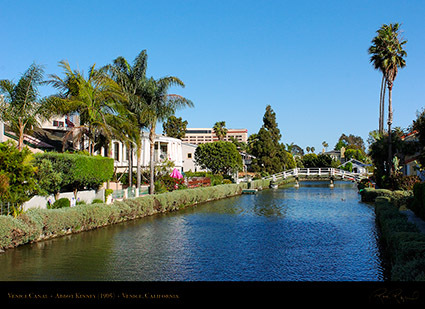 Lots on the Canals are 30 feet wide by 80-95 feet deep. 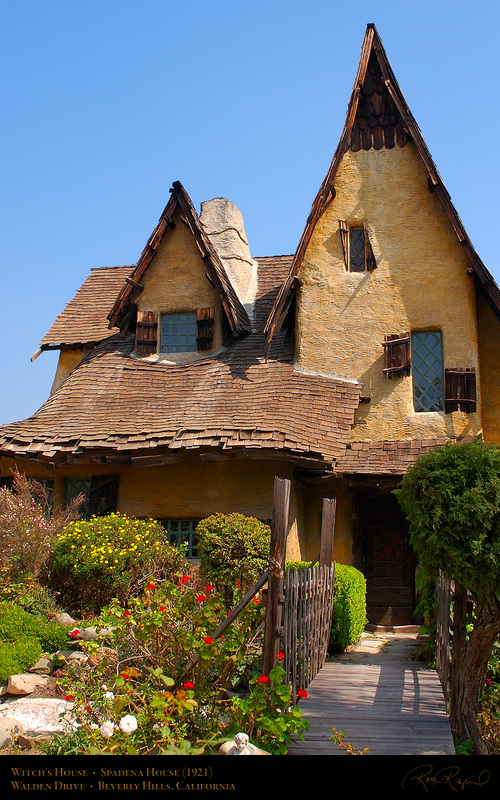 Home prices are now $1.6-$4 million. 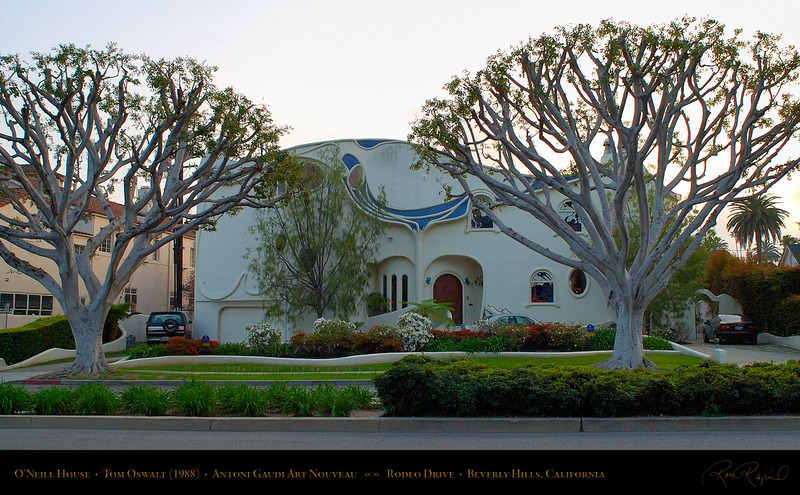 Marina del Rey developers, and in 1981 a crew sent by a developer-sympathizer painted out the mural. A crew of canal folks immediately came with hoses and brushes and removed the paint before it dried. and scrubbed it all off, but a green residue remained, especially over the sterile white marina area. of the Canal community, and after stories appeared in newspapers, the homeowner backed down. 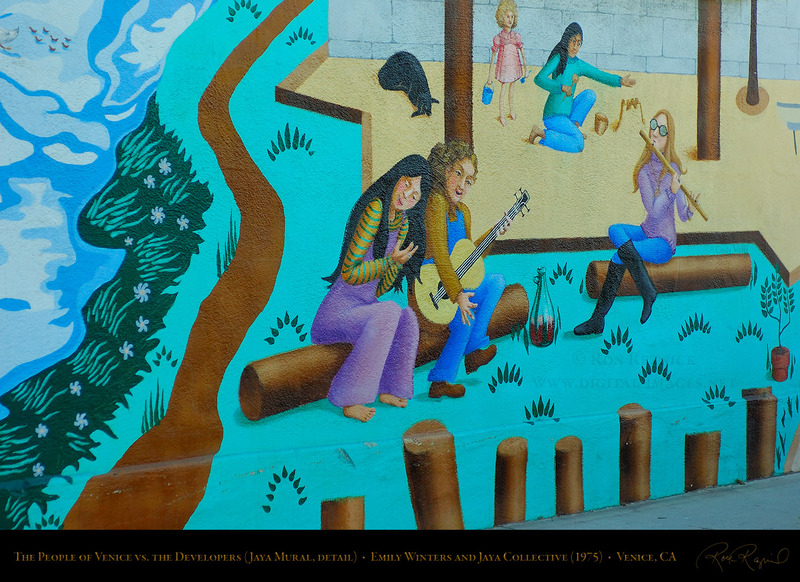 In 1997 the original core of four artists who painted the mural in 1975 restored it to its former glory. 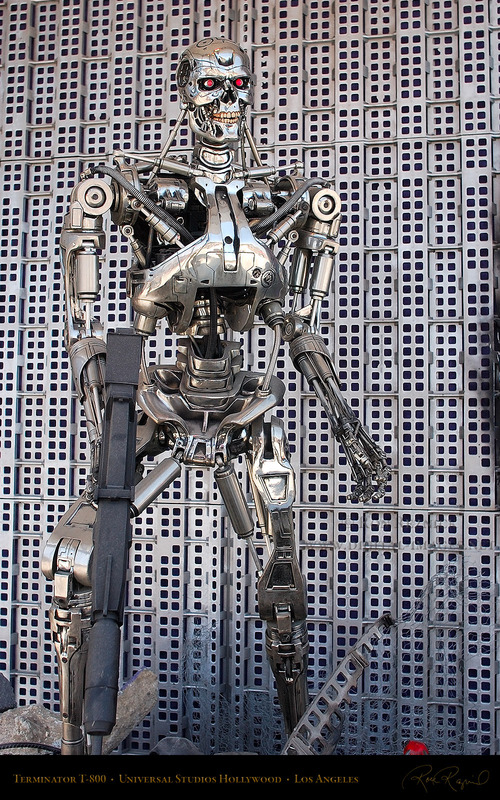 In 2006, the mural was so badly tagged with graffiti that the building owner was going to paint it out. 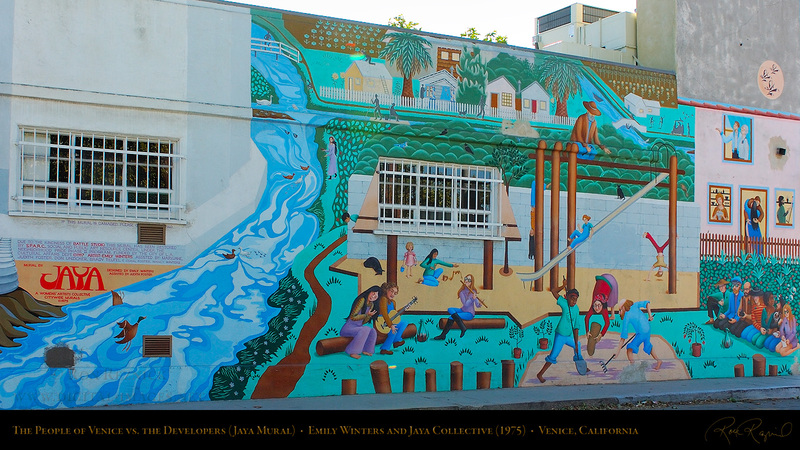 Emily Winters (the original designer and lead artist) and her team again restored the mural in 2008.
showing the idyllic life in the Venice Canals in the early 1970s. Note the post-hippie clothing styles. held at Weller Court in Little Tokyo, Downtown Los Angeles. but the lion design and style of dancing are different (they also differ by region). usually an olive green cloth with white designs, manipulated by one or two people. 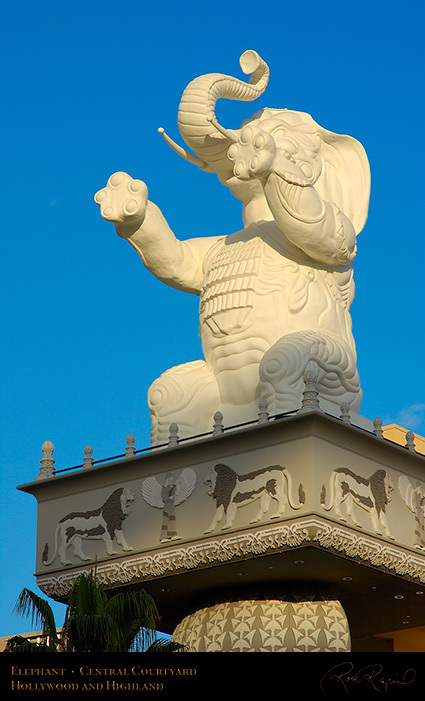 and the tallest structure in Chinatown when completed. 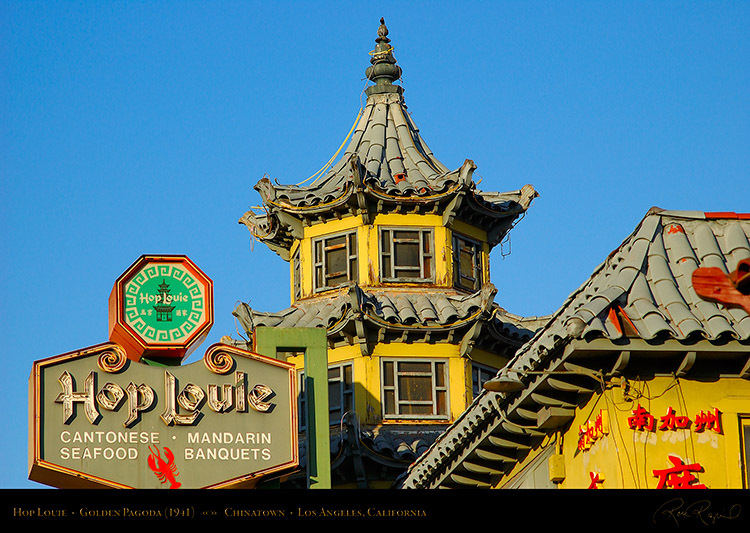 The best table in the house is in the pagoda. 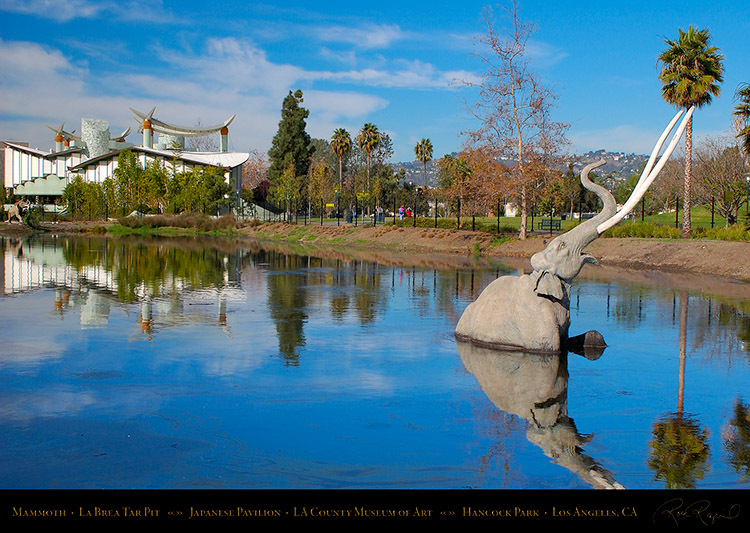 A life-size female Columbian Mammoth screams as she sinks into the large La Brea Tar Pit. In the background at left is the Japanese Pavilion of the LA County Museum of Art (LACMA). 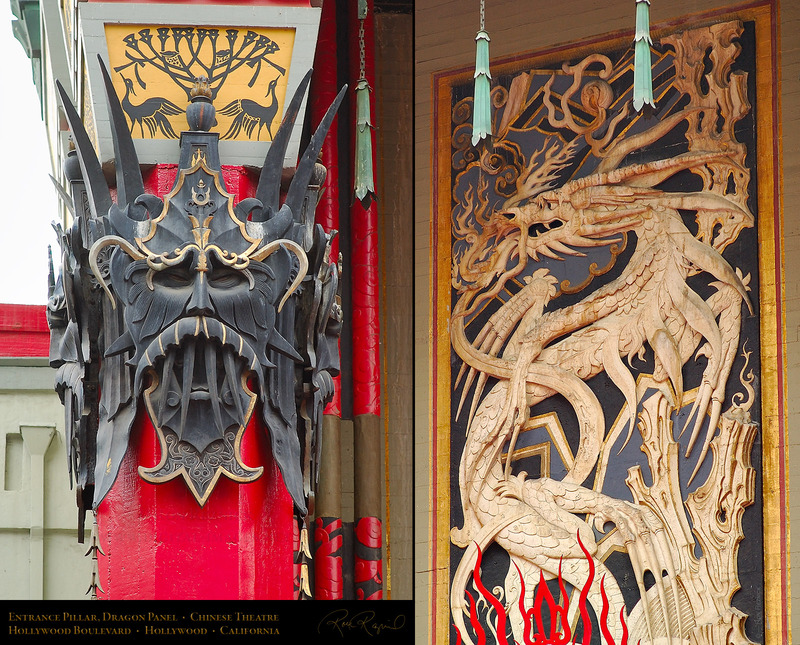 More images of the Mammoth and the Japanese Pavilion are on the Scenic Potpourri page. 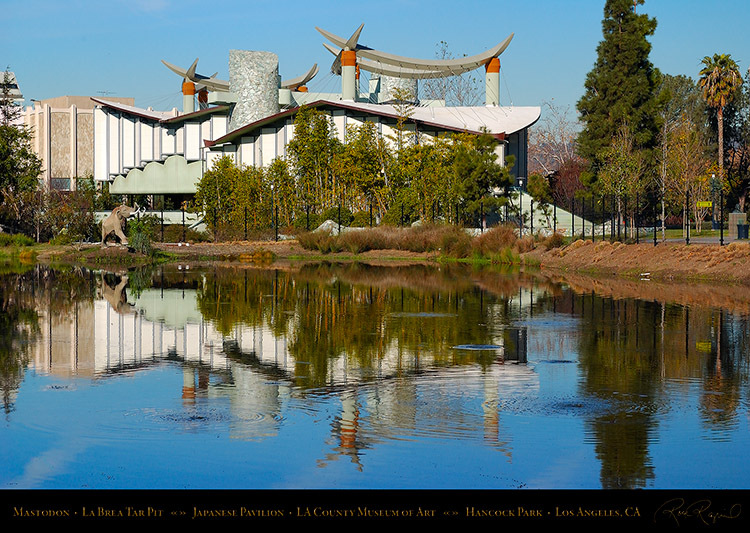 The LACMA Japanese Pavilion and an American Mastodon are reflected in a La Brea Tar Pit. 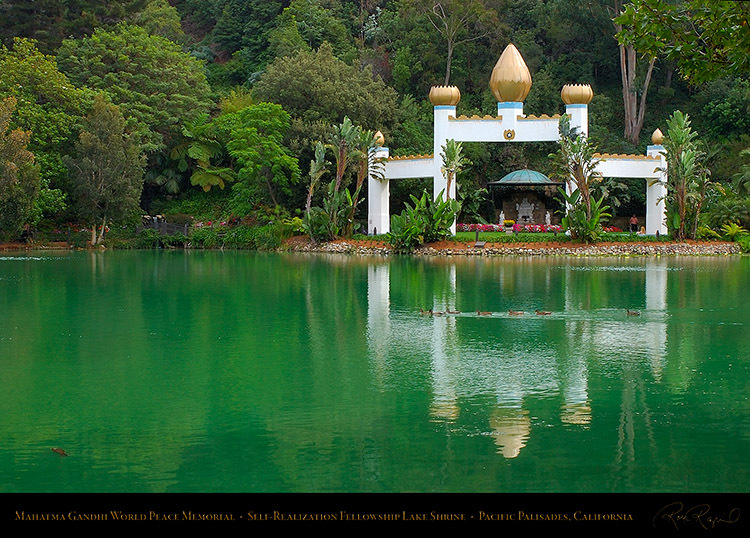 Yogananda founded the Lake Shrine in 1950 (more images on the Scenic Potpourri page). 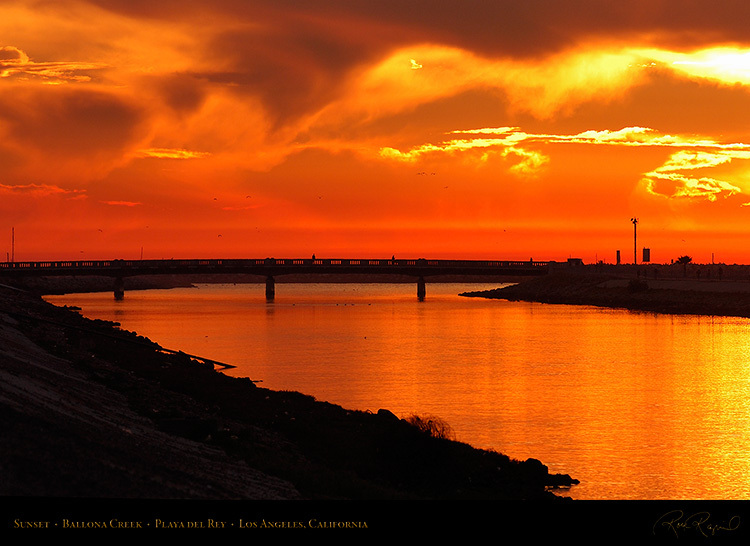 A spectacular Pacific sunset at the mouth of Ballona Creek south of Marina del Rey in Los Angeles.